The map in this tutorial displays two kinds of markers to differentiate between the location of restaurants and bars respectively. A database in MySQL stores information about the individual marker locations like the type of place (whether it's a restaurant or a bar), its name, address and geographic coordinates. The map retrieves this information from the database, through an XML file that acts as an intermediary between the database and the map. You can use PHP statements to export marker information from the database to an XML file. Click a marker on the map below to display an info window with the location name and address. The markers have the labels 'R' or 'B', and they show you the locations of restaurants and bars respectively. Tip: Check out the Clothing Store Locator solution to see another example of MySQL and PHP. var request = window.ActiveXObject ? Install, set up and configure a MySQL server with PHP on your machine. Create a table in MySQL containing attributes of the markers on the map, like the marker id, name, address, lat, lng, and type. The id attribute serves as the primary key, and the type attribute distinguishes between restaurants and bars. To keep the storage space for your table at a minimum, you can specify the lat and lng attributes to be floats of size (10,6). This allows the fields to store 6 digits after the decimal, plus up to 4 digits before the decimal. You can interact with the MySQL datbase through the phpMyAmin interface. The screenshot below displays the table setup in phpMyAdmin. You can also use SQL commands to create the table, as in the SQL statement below. 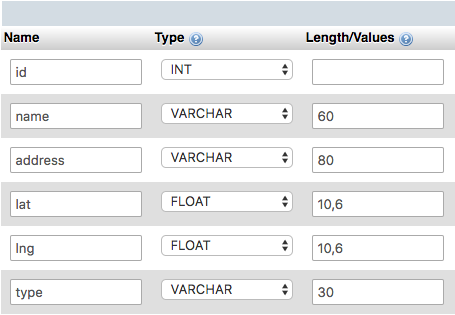 You can import the marker data into the SQL database using the 'Import' functionality of the phpMyAdmin interface which allows you to import data in various formats. Below is the marker data for the map in this tutorial, in the .csv format. You can also use the SQL commands below to import the marker data into the SQL table. If you have never used PHP to connect to a MySQL database, visit php.net and read up on mysql_connect, mysql_select_db, my_sql_query, and mysql_error. You can use any of the three different techniques below to output the SQL table data as XML with PHP. When using a public browser to access a database using PHP files, it's important to ensure that your database credentials are secure. You can do this by putting your database connection information in a separate PHP file to that of the main PHP code. The file with your credentials should look like the one below, but containing your own database information. The DOM XML functions of PHP take care of subtleties such as escaping special entities in the XML, and make it easy to create XML with more complex structures. You can use DOM XML functions to create XML nodes, append child nodes, and output an XML document to the screen. To determine if your server's PHP has the DOM XML functionality enabled, check your configuration or try initializing a domxml_new_doc(). Below is the PHP file that connects to the MySQL database, and dumps the XML to the browser. In the file above, the PHP code first initializes a new XML document and creates the "markers" parent node. It then connects to the database, executes a SELECT * (select all) query on the markers table, and iterates through the results. For each row in the table (each location), the code creates a new XML node with the row attributes as XML attributes, and appends it to the parent node. The last part of code then dumps the XML to the browser screen. Note: If your database contains international characters or you otherwise need to force a UTF-8 output, you can use utf8_encode on the data output. If you don't have access to PHP's dom_xml functions, then you can output the XML with the echo function. Use a helper function (e.g. parseToXML) when using just the echo function to correctly encode a few special entities (<,>,",') to be XML friendly. The code above connects to the database and executes the SELECT * (select all) query on the markers table. It then echoes the parent markers node, and iterates through the query results. The code then echoes the XML node for the marker in each row of the table (for each location). This sends the name and address fields through the parseToXML function first, in case there are any special entities in them. The script ends by echoing out the closing markers tag. Note: You can use utf8_encode on the XML data output if your database contains international characters, or if you need to force an UTF-8 output. The code above initializes a new XML document and creates the "markers" parent node. It then connects to the database, executes a SELECT * (select all) query on the markers table, and iterates through the results. The code then creates a XML node for each row in the table (for each location), with the row attributes as XML attributes, and appends it to the parent node. It then dumps the output XML to the browser screen. Note: If your database contains international characters, or you need to force a UTF-8 output, you can use utf8_encode on the data output. To confirm that the PHP script is producing valid XML, call the php script file you created from your browser to see the XML output as below. If your browser isn't displaying the marker data from your database as an XML output, try debugging by removing the line in the file that sets the header to the text/xml content type. This line may cause your browser to try to parse XML and make it difficult to see your debugging messages. Create a new file in a text editor and save it as index.html. Read the sections that follow to understand the code that you can add to this file. To load the XML file into the page, you can take advantage of the browser-provided XMLHttpRequest object. This object allows you retrieve a file that resides on the same domain as the requesting webpage, and is the basis of "AJAX" programming. url specifies the path to either your XML file or to the PHP script that generates the file, depending on whether you want to dynamically update the XML file when your database changes. This map in this tutorial calls a static XML file for the marker data. It is usually easiest to have this XML file reside in the same directory as the HTML file so that you can just refer to it by filename. The code below shows you the function declaration. Note: Since the XMLHttpRequest is asynchronous, the callback function initiates the downloadURL function based on the size of the XML file. The bigger your XML file, the longer it may take. For this reason, it would be best not to put any code after the downloadUrl that relies on the markers inside the callback function. Instead, such code can be put inside the callback function. Now that you have defined the function, you can call it from your code, passing in the name of your PHP file and callback function. The map in this tutorial calls a static XML file for the marker data, as in the code below. The code below shows you how to add custom labels for your markers by first creating an associative array. This associates your labels with the marker type strings: restaurant or bar. This makes the labels easy to reference when you create markers from the XML file. When creating markers, you can retrieve the appropriate marker labels by using the type as a key for the customLabel associated array. Forward the .label property as a google.maps.Marker constructor option. Next, create the HTML that you want to show up in the info window by concatenating the name, address, and HTML tags to emphasize the name. After constructing the HTML string, the code below adds an event listener to the marker which displays an info window on click. Open the index.html file in a browser. When the page loads, the initMap function sets up the map and then calls the downloadUrl function. This function iterates through all the marker elements, and retrieves the name, address, type, and latLng attributes for each marker element. The code then creates markers, adds the markers to the map, and binds an info window to each marker to display a description on click. If you want to plot markers on a map using your own location data, you can use a batch geocoding service to convert addresses into latitudes and longitudes for your markers.